Renowned Polish filmmaker Krzysztof Zanussi has described censorship as a world problem and called for reasonable ways to handle it. He said, Censorship is an ugly method of improving our life and added that Police states tackle this problem in a harsh way, while democratic nations do it in a far more reasonable manner. 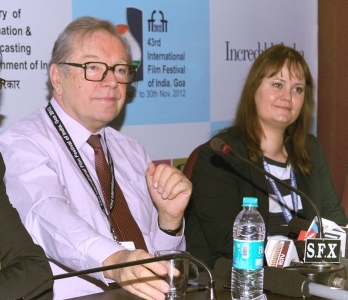 Zanussi, who will be honoured with the prestigious Lifetime Achievement Award at the 43rd International Film Festival of India (IFFI) in Goa this evening, was addressing the media here this morning. Known for producing acclaimed films like Camouflage, Family life, The Silent Touch, The Contract and Revisited, Zanussi pitched for great ideas to shape the world. Replying to a question on censorship issues in India, he said, Internet may build a completely new society or it may destroy us, so the big challenge is to find a balanced way. His film “Illumination” will be shown at the festival. Talking about Indian Cinema, the Polish Master said that Independent Cinema and the popular films are complimentary and one must respect the later for being the representative of common culture, though not satisfying to personal tastes at times. On cinema in his home country, Zanussi said, though it is doing well on a contemporary note, but they are not well recognized as was the case during the political turmoil of early 80’s. He said, life is better now in Poland than the Communist era, but the young filmmakers have to cope up with new tragedies and new injustices. Dwelling on the subject of Physics, which Zanussi studied and its relationship with cinema, he said, physics when taken seriously is not engineering but closer to Philosophy. Describing Cinema as a young discipline, the Polish Master, who produced more than 80 films and documentaries, said that his best is yet to come.